1. The application should represent a commonly performed or required skill set and/or disease process: Given the time, effort, and expense required to build a simulator, it is important that a simulator can be applied to a wide audience. For example, a simulator for training tasks such as laparoscopic port placement, Veress needle insertion, or full procedures for common diseases such as laparoscopic radical prostatectomy may be more widely used than a simulator that teaches laparoscopic excision of a urachal cyst. 2. The skill sets embedded in the application should represent a prolonged learning curve: If a skill set is not difficult to master, traditional training methodologies may be sufficient. Making a simulator or a module intended to train the bagging of a kidney specimen may be less useful than one for completing the urethral anastomosis during a laparoscopic radical prostatectomy. This issue is magnified in laparoscopic surgery, as it can be more difficult for the trainer to monitor and recover from an error performed by a trainee as compared to that which may occur in an open case. One example of a procedure that presents training risk for patients would be the hilar dissection during a laparoscopic nephrectomy. 4. 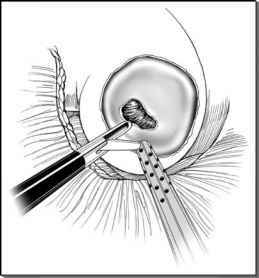 The application should address skill sets characterized by a significant training gap between preparation training and patient practice: This issue is prevalent throughout laparo-scopic urology since only the most recent graduates from select residency programs or laparoscopic fellowships received concentrated training in this arena. An entire generation of urologists is currently reliant on weekend courses, training videos, box trainers, and mentors to perform complex skills that many believe are the standard of care. It might be questioned that the skills gained from these training mechanisms adequately carry over to the operating room. With little or no objective assessment of skills prior to credentialing, it can be difficult to determine whether a trainee is ready to work with patients. 5. Choose an application that is amenable to simulation: It is important to choose a procedure that can be represented given the current level of technology. This used to be a significant limiting factor because the technology did not exist to address issues such as rendering complex tissue structures and their deformation. However, more recently, the consensus has been that most laparoscopic procedures could theoretically be simulated with acceptable accuracy. However, while we still lack an accurate model of the human body, it remains difficult to represent characteristics such as fluid flow and electrochemical reactions. Applications that are dependent on such intricate modeling, given current technology, may be doomed to failure.